Apple and cinnamon bundt cake. 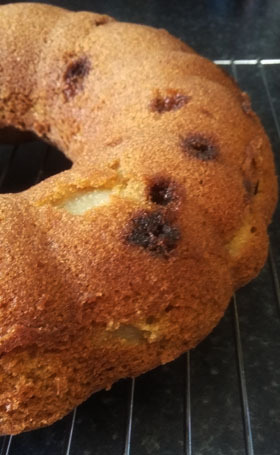 This cold weather calls for a delicious slice of cake, or two; and this tasty apple and cinnamon bundt cake will certainly hit the spot. A delicious bake filled with slices of apple and a yummy cinnamon taste, a very delicious combo and a great way to use up any apples in the kitchen. Pre heat the oven to 180c/160c fan/gas mark 4 and grease your bundt tin, really work it into the sides of the tin to ensure it's evenly covered. First, melt the butter on a low heat, stirring occasionally; this works perfectly in place of the usual milk or yogurt in a bundt cake to add plenty of moisture. Once melted set aside. Sift together the flour, cinnamon, salt, and bicarbonate of soda, and mix well, set it aside. In a separate bowl combine the sugar and eggs with the melted butter, stirring until well combined and smooth. Add this to the dry mixture and stir to ensure it's all evenly mixed, scrape the bottom of the bowl to ensure that any flour at the base of the bowl is mixed in. Cut the apples into thin slices then fold into the mixture, ensuring that they're all covered in cake mixture. Spoon the mixture into the tin and smooth down the top. Place the bundt tin in the middle of the oven, and bake for 30-45 minutes. In my fan oven this cooked rather quickly at 30 minutes, but it may take longer in a conventional oven. 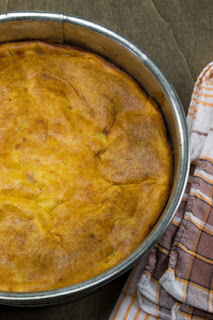 Remove the cake from the oven and set aside to cool in the tin for 10 minutes, then gently wiggle a rubber spatula around the edges of the cake to loosen it, leave it for another 5 minutes then place upside down on a wire rack. The cake should come out with ease, but a gentle tapping around the top of the tin should help to ease it out. 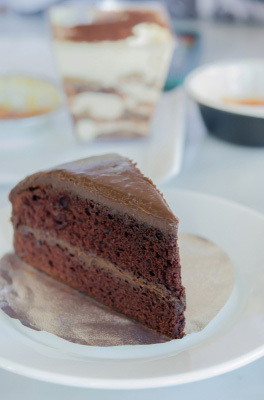 You can leave the cake as is, or sprinkle some icing on top to finish, either way it's still delicious! Recipe adapted and downsized from Angie Muldowney. 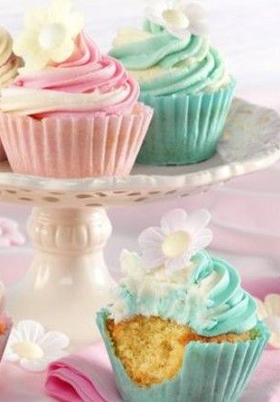 Edible cupcake cases : do we dare?! There's something quite delightful about peeling back the casing off a cupcake before you start to tuck in so with the recent addition of edible cupcake cases to the baking world I ask, do we dare to eat the cupcake case?! Cases are there to make the bake look even prettier, to add a supportive casing to the delicious cake contents as they bake away and to make devouring that tasty cupcake on the go easy. They come in all shapes and sizes, styles and even intricate detailing, half the fun of eating a cupcake is admiring the pretty casing, especially when it's a pretty lace detailed case or a lovely ribbon adorned casing. Recently the cupcake case became edible, no don't start trying to eat that polka dotted case in your hand, I'm talking about edible wafer cases. 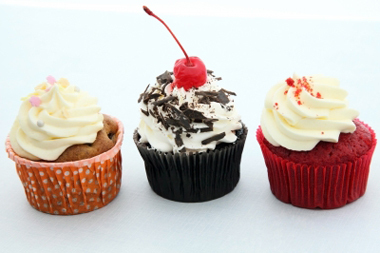 Much like edible paper, the edible cupcake case has been designed to allow for both stability during the bake and eating afterwards. Recently unveiled by Dr Otker, the edible case has been designed to add an extra special, edible addition to your baking, to save on the waste of those paper cases. An innovative method to add to your baking repertoire as they've even been designed to be free-standing thus doing away with the need for a cupcake tray, but much like Mrs Doyle's protests against the tea maid doing away with the misery of making tea, what about those of us that like the faff of lining a cupcake tray and peeling away the cupcake casing off a freshly baked cupcake?! Maybe I'm being miserable and old, but the idea of the edible cupcake case hasn't exactly had me rushing out to buy a pack, especially when they only come in packs of 6, that can become one expensive bake, even if you can eat all of it..
Much like the novelty of edible paper decorations in cupcake kits, I can imagine the excitement of trying something different, but you do wonder how long the novelty of eating your cupcake cases will last. Perhaps, one day, I'll come around to the edible way of thinking, but me, I like my cupcake cases in classic paper form, enjoying peeling away the casing from each cupcake and cooing over the pretty printed cases. Why not judge for yourself and see if the edible case wins you over?! You can't beat a classic, this Victoria sponge cake may seem rather plain at first, but what it lacks in lashings of buttercream and toppings, it makes up for with it's heavenly fluffy texture and sweet taste. 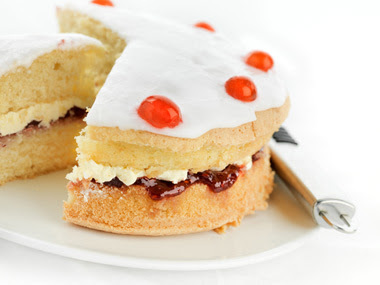 A good all round classic cake that can't be beat for an afternoon tea! Pre heat oven to 190c/170c fan/gas mark 5, grease and line two round 6" sandwich tins. Cream together the butter and sugar until pale and fluffy, then add in the eggs one at a time, mixing as you go. Sift in the flour and fold in till combined, then add in the vanilla essence and mix, the result should be a lovely light mixture with a slight dropping consistency (you'll notice it has a lovely light, airy feel to it when you spoon the mixture into each tin). Divide the mixture between the two tins, then bake for 20-25 minutes till risen and golden. Leave the cake in the tins for 10 minutes, then remove and place on a wire rack to cool. Once cooled, place one half of the cake onto a plate, then spoon the jam on top, use whichever flavour you prefer, it doesn't have to be the traditional strawberry jam! I opted for a tasty cherry conserve with my cake. 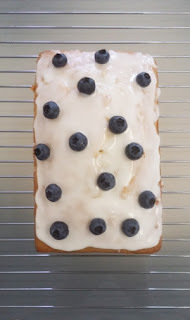 Spread the jam evenly across the cake with a knife, then place the second half on top. Finish off with a sprinkling of icing sugar on top, then your deliciously sweet bake is complete! Recipe adapted from Fortnum & Mason's "Tea at Fortnum & Mason". 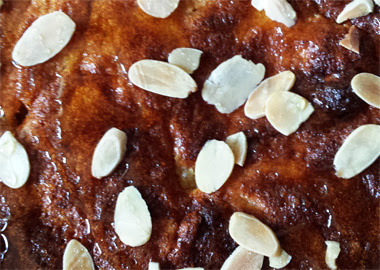 Over indulge without the worry with this delicious honey and almond cake, all the taste and without a pinch of sugar! How marvelous! Pre heat your oven to 180c/160c fan/gas mark 4 and line a cake tin. To start separate the eggs, keeping the egg whites aside for later. To the egg yolks add the ground almonds, honey, vanilla and baking powder and mix, don't worry if it looks a bit clumpy at this stage. Next whisk the egg whites, until they are very foamy, white and doubled in volume, but not stiff enough to hold peaks. Gently fold the egg whites into the ground almond mixture until it's just combined. Now carefully spoon your mixture into the cake tin and bake for 25 minutes, or until a skewer comes out clean. 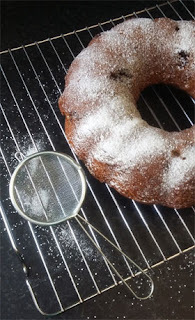 Leave the cake to cool off in the tin for 15 minutes. 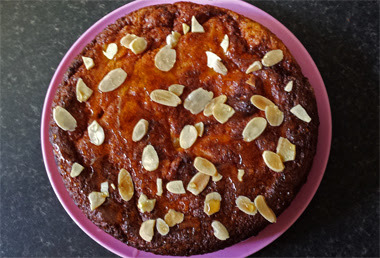 Remove the cake from the tin and leave to cool for half an hour, then place it on a cake stand or plate and carefully drizzle spoonfuls of honey over the top of the cake, adding flaked almonds to decorate. Best eaten: This tastes both delicious when warm after decorating and the following day when the honey has set into the cake. A delightful classic, you can never go wrong with a coffee and walnut cake, perfect for a mid morning treat, evening snack or when you prefer a bit of a cake for lunch.. basically any excuse is good.. Beat together the butter and sugar until pale and fluffy, gradually add the eggs and mix. Fold in the flour, baking powder, walnuts and coffee mixture and combine well. Divide the mixture between the two tins (clever tip: weight each tin one at a time to ensure you get a nice even distribution between the tins) and bake for 20 minutes or until a skewer comes out clean. Leave to cool in the tins for 15 minutes then remove and place on a rack to cool. Whilst your bases cool down mix up the buttercream for your cake. Whisk together the butter and half of the icing sugar until creamy, add the remaining icing sugar along with the coffee mixture and blend until light and fluffy. 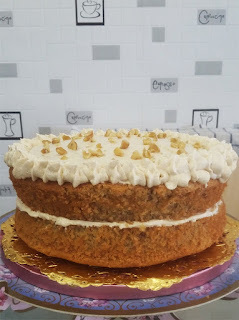 Place the base on a plate and spread half of the buttercream on top of this, place the other cake half on top then spread the remaining buttercream on top. Sprinkle with walnuts to decorate. 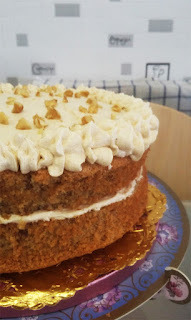 Best eaten: shortly after decorating, the freshly made buttercream tastes delicious on this cake but it also lasts few well for several days in a cake tin, if you don't eat it all straight away that is.. Adapted from Fortnum & Mason's "Tea at Fortnum & Mason" book. 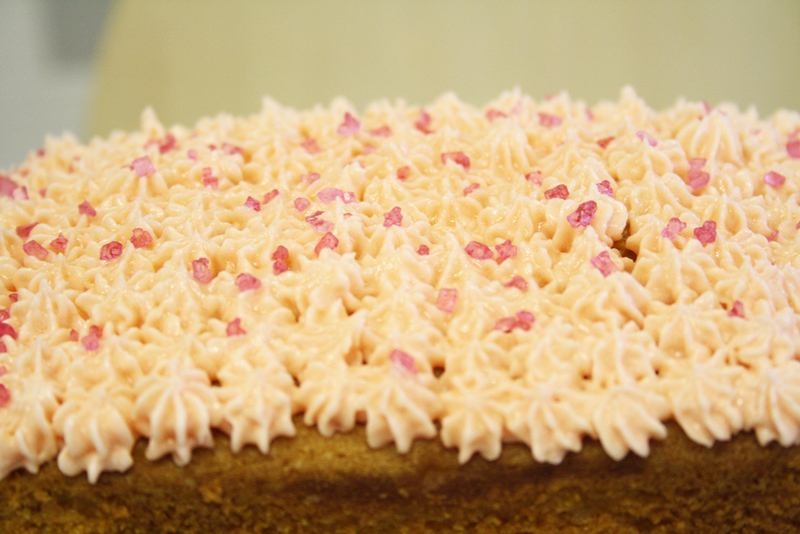 Deliciously sweet: Pink lemonade cake. A scrumptious bake that takes the tasty flavours of the classic beverage and compacts it into a deliciously sweet cake. 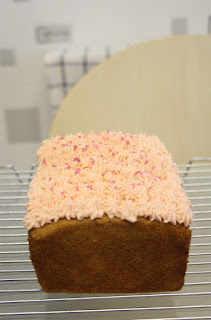 Not your usual pink lemonade cake, this yummy loaf shaped treat is just as delightful and incredibly easy to bake, it's perfect when you want to tempt your sweet tooth! Pre heat your oven to 180c/160c fan/gas mark 4, then grease and line a loaf tin with a strip of baking paper, this will make it easier to remove your bake! Cream together the margarine with the caster sugar and icing sugar, using the Sugar and Crumbs pink lemonade icing sugar will add a lovely taste to your bake, as well as making it delightfully light and incredibly more-ish. However, if you'd prefer not to use the icing sugar you can add 180g of caster sugar instead. Cream together till pale and fluffy, then add in the eggs one at a time and mix. Add in the lemon juice and zest and stir to combine, followed by the flour, then stir well to combine the mixture. Spoon the mixture into the loaf tin and bake for 45-50 minutes till a skewer comes out clean. Leave in the tin for 15 minutes, then remove and place on a wire rack to cool. Once your cake has cooled, start mixing the frosting to pipe on top. 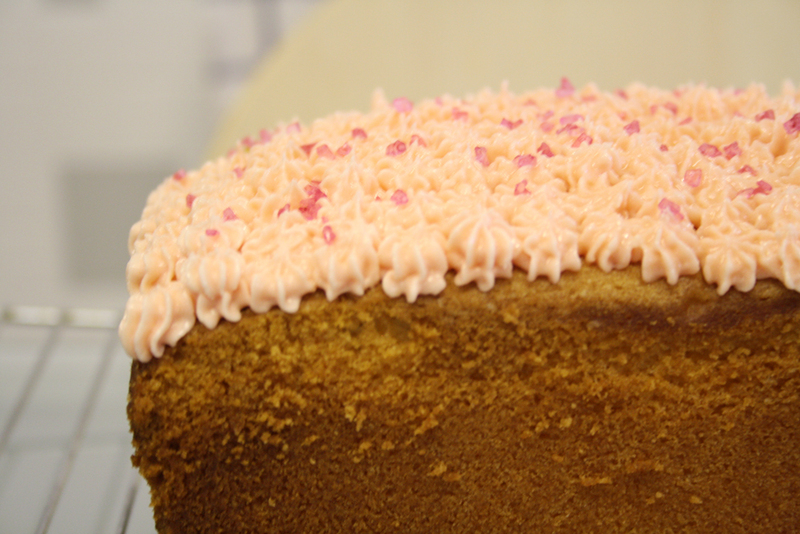 Whisk together the margarine with half of the icing sugar - using the pink lemonade icing sugar to add a sweet topping to the cake will finish the flavour off perfectly! If you'd prefer not use this, you can add some raspberry flavouring to the buttercream once mixed. Sift in the remaining icing sugar and whisk till combined, then add in the food colouring to create the perfect pink frosting! Use either pink, or a small dab of red food colouring to finish your frosting off. 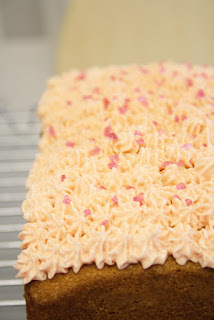 Spoon the frosting into a piping bag, I used a small star nozzle for mine to create the pretty pattern on top. Pipe small dots of the frosting on top of the cake, row by row, to create the look. Then sprinkle some pink neon sugar on top to finish! 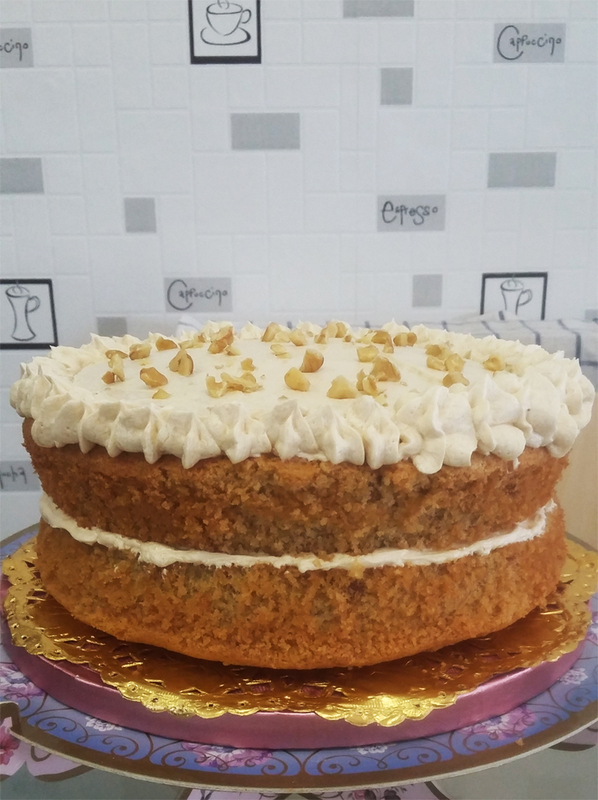 A lovely sweet treat that's inspired by the tasty flavours of the classic beverage, this cake should last well for a few days when kept in an airtight container. 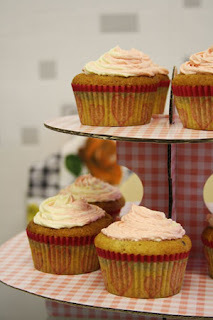 A pretty swirled treat : Raspberry ripple cupcakes. A cheerful little treat with these pretty swirled raspberry ripple cupcakes, with a delightfully sweet treat hidden inside! Tuck into a tasty batch (or two) with this wonderfully cheeky recipe, that's perfect anytime of the day. Cream together the butter with the sugar till pale and fluffy. Add in the eggs one at a time and whisk as you go, ensuring that they're fully blended. Sift in the flour and fold to combine the mixture, scraping the sides of the bowl to ensure that it's fully mixed, then add in the vanilla extract and stir to mix. Finish off by adding the raspberry jam, gently swirl the jam into the mixture, this will create a pretty swirl when lightly mixed in. 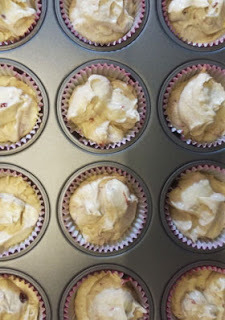 Once your cupcakes have cooled, start mixing your buttercream, for mine I mixed some pink and cream coloured frosting to create a dainty swirl pattern on my cupcakes. 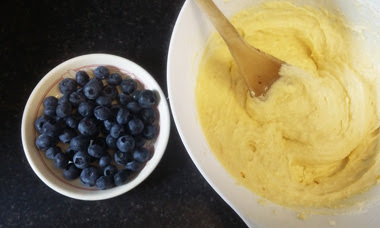 First you'll want to mix everything together, start by mixing together the butter with half of the icing sugar till combined, whisking for another minute to ensure it's fully mixed. Then sift in the remaining icing sugar and mix again till fully combined, followed by the vanilla extract to finish. Whisk your buttercream for 2-3 minutes to reach a lovely light consistency. Now you'll want to separate the mixture into two bowls to create the swirl of buttercream for your cupcakes. In one bowl you'll be leaving the buttercream as is, then in the second bowl add a drop of two of red or pink food colouring and mix, I used a small dab of Sugarflair's Red Velvet colouring for mine. Once mixed, you'll want to start spooning the buttercreams into a piping bag, I used Lakeland's Duo colour icing kit for my cupcakes. Spoon the two separate buttercreams into the compartments, this will mix the two icings together to create the swirl once you start piping the buttercream out, so no need to mix the two together yourself! Pipe swirls on top of each cupcake to finish off, resulting in a pretty colourful swirl of buttercream! A lovely treat, the finished result will have surprise pieces of raspberry jam inside each cupcake thanks to mixing the jam in with the cupcake mixture, with a lovely sweet buttercream to finish, in a ripple like swirl on top! How lovely! 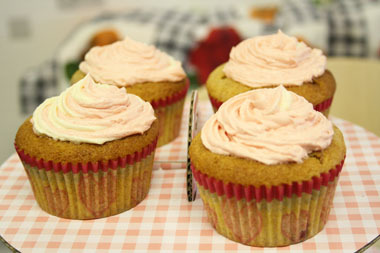 Recipe adapted and inspired by Primrose Bakery's "Cupcakes from the Primrose Bakery" book. A deliciously sweet little treat that's packed with yummy blueberries, so you could technically claim it as one of your five a day... Incredibly easy to bake, and delightfully more-ish, it's perfect for an afternoon treat! Pre heat your oven to 170c/150c fan/gas mark 3, grease and line a loaf tin with a strip of baking paper, this will make it easier to remove your bake! Cream together the butter and sugar till pale and fluffy, then add in the eggs one at a time and mix. Sift in the flour and mix well to combine, then add in the lemon juice and mix. 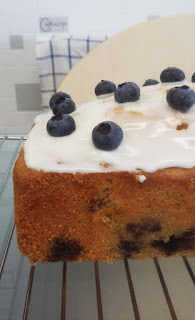 Add 1 tbsp of flour to the blueberries and mix to coat them, this will stop them from sinking to the bottom of the cake, then add the coated blueberries to the mixture and stir to combine. Spoon the mixture into the tin and smooth over, bake for 45 - 55 minutes till a skewer comes out clean. In my fan oven this cake took 45 minutes. Leave to cool in the tin for 20 - 30 minutes, then remove from the tin and place on a wire rack to cool. Finish the cake off by mixing a thick water icing with some lemon juice and spoon on top of the cake, I used a small measure of icing sugar for mine to 3 - 4 tsp of juice. Then finish off with a handful of blueberries to decorate. A delightfully sweet bake, this should keep well for several days when kept in an airtight container. Recipe adapted from: Good to Know. Bake a scrumptious cake every time with these handy tips. There's no secret baking code that's passed down to bake the perfect cake, just a simple bit of preparation can result in turning that gooey mixture into a divine spongey treat. However you prefer your bakes it all starts with a few simple ingredients that can result in the perfect bake every time! Take your classic sponge cake, every recipe starts with the same essential ingredients that when combined together can create the perfect bake. For me, you really can't beat a classic bake, its one that can easily be adapted by adding different flavours and ingredients, or you can stick to the staple recipe and add lashings of buttercream or jam for a simple, yet delicious bake. It may not look like much, but those essential ingredients will result in the perfect bake every time! But it's not just the ingredients that help the bake along, following a basic recipe helps to combine those ingredients for the perfect cake. It's one that can easily be adapted, if you fancy a chocolate cake for instance simply adjust the quantities by using 30g of cocoa powder with 175g of self raising flour. 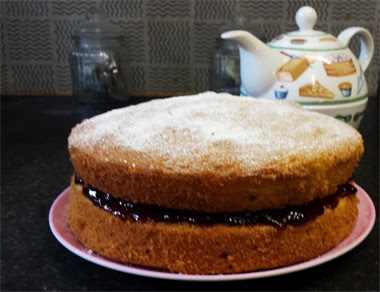 Take my recipe for the classic Victoria sponge cake, it follows the same basic pattern as every good cake recipe, starting by creaming together the butter and sugar till pale and fluffy, but what exactly is pale and fluffy? As you start to mix the two ingredients together using a whisk you'll notice that they start to combine together, the more the two ingredients blend together the fluffier and paler the mix will go, it's not rocket science, just simple baking! Adding in the eggs one at time to this mixture lets the eggs slowly combine with the butter sugar mix, resulting in a lovely runny mixture once you've mixed all three eggs in. Then simply mix the flour in with the batter and you'll have the perfect cake mixture, it should have what Mary Berry often refers to as 'dropping consistency', this means that the mixture should drop off the spoon perfectly. It will be thick but not too clumpy, but light and airy, this may sound like madness to novice bakers, but once you've mixed your ingredients together it will make perfect sense. Getting the rise just right. The perfect mixture also needs the perfect setting, start as always by pre heating your oven and lining your tins before you begin mixing your ingredients together. This will allow the oven to reach the optimum temperature before you bake your cake, and pre-lining your tin simply saves you some time once your mixtures ready, as your tins will be ready to go. Spoon your mixture into the tin and smooth it over before placing the tin in the oven, I use the back of a spoon to smooth the mixture and ensure it's evenly distributed in the tin. Then the secret to that perfect rise is to turn the oven down a notch before placing the tins in the oven, not much, just adjusting your temperature by a fraction - i.e turn it down to 150c from 160c. Simple tips like not opening the oven door help with the bake, as tempting as it can be, leave the bake till the allotted time on the recipe, if it says 20-25 minutes, leave it till the 20 minute mark to check on the bake. A cake skewer is the perfect tool for any bake, use it to check your bake is done, if any mixture comes out, it needs a little longer to cook, if it's clean then your bake is ready! The perfect finish for your bakes. Once they've cooked remove your cakes from the oven, leave the cakes in the tin for a short time, I usually leave my cakes for no more than 10 minutes in the tins, then remove them and place on a wire rack to cool. Run a knife around the edge of the cake whilst it's in the tin, then place your hand on top of the cake, and turn the tin upside down to release, then place it base side down on the wire rack. Leaving the cake to cool will ensure that you don't have runny buttercream or jam when filling your cake, ideally leave the bases to cool for at least an hour to ensure the perfect finish on your cake, then fill however you like! 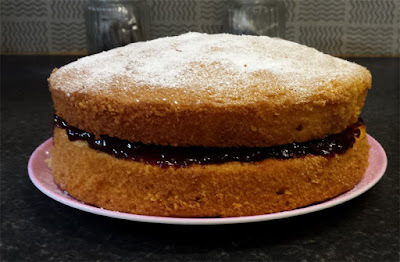 You can't beat a good squidgy buttercream filled cake, but some days you prefer just a smidgeon of jam, the trick to the perfect cake is to use flavours and fillings that you love. A good dollop of cherry jam is one of my faves for a tasty quick bake, but some days you can't beat a generous layer of vanilla buttercream with a layer of tasty jam on top. It doesn't have to be a perfectly decorated, fondant and sugar paste covered cake to be the perfect bake, just a few staple ingredients and additions can create the perfect bake that's utterly delightful - personally I prefer a lavish layering of buttercream to fondant! However you prefer your cakes, starting off with the staple basics and methods will result in the perfect cake every time, adapt it however you prefer and you'll have an utterly scrumptious bake that will go down a treat. Besides, if it doesn't go according to plan that first time, you can always eat the evidence! Images: Douglas_Freer/Dreamstime Stock Photos, Mister GC/FreeDigitalPhotos.net & Free Images/Rakratchada-torsap.